The big group split up for our hitching adventure but Ya Ya, Utah Aaron, Cosmo, and I stood together with our thumbs out. The first car to stop was going all the way to Sonora Pass and had room for two - so in went Ya Ya and Utah Aaron. The next car was going to the highway juncture and had room for Cosmo and I. When we got to the juncture we had our thumbs out for about 15 minutes when a Mazda van pulled up and inside were Woodchuck, Rooster, Happy Baby, Link, and Soulshine. Cosmo and I piled in and we made it to Sonora by 3pm. We hiked 10 miles tonight. The scenery has quickly changed from granite to a rusty-colored volcanic rock. The landscape was interesting and uniquely beautiful. I hiked a lot of the evening with Happy Baby, learning more about him and his family. Hearing him share his stories made the evening much more enjoyable and helped the miles fly by. We all made it to camp for "family" dinner. We cooked, laughed, and made plans for this section of hiking. Today was mellow, I spent the morning walking with Woodchuck, Ya Ya, and Soulshine. 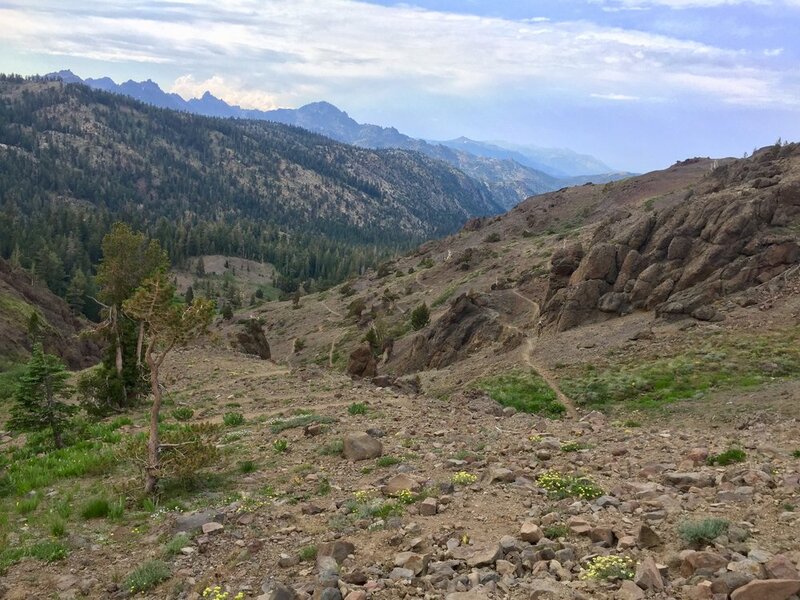 The terrain was reliable Pacific Crest Trail smooth with rolling hills. The wildflowers were abundant along the hillsides where we walked and the weather felt perfect for hiking. There was one big ominous cloud in the sky that resonated with deep and intimidating sounds of thunder throughout the day, but the storm stayed on the outskirts for the most part. We got a few minutes of drizzle but the sun quickly returned. The later half of the day I hiked with Cosmo and we listened to podcasts out loud as we walked along the beautiful rocky trail. The dark volcanic rocks around us look more like the scenery of Utah, not California. I love it. We finished 21 miles by 6:30pm and found the others at the campsite. All eight of us cooked dinner (and 2nd dinner for some), and hung out until dusk settled into night before settling inside our cozy tents. Today was my biggest mileage day on trail, 29.1 total! Even though I was an ultra runner in my previous life, this number felt like an accomplishment. It's been a while since I've felt strong enough to get 20 miles before sunset, and today was almost 30. The next challenge is to keep up this pace, as we need to sustain long mileage days to make it to Canada by early October. The trail today was rolling with gentle ups and downs, much different from the Sierra section we were used to. At 4pm the afternoon thunder struck up along with ominous clouds which surrounded the revealed rocky hillside we were walking along. Normally we avoid the afternoon storm but today we did not. The thunder got louder, lightening became visible, and rain and hail started pour down. Utah Aaron and I were hiking together at the start of the downpour, but he decided to stay back and wait for Ya Ya. Utah Aaron hiding on a cliff with his umbrella, waiting for Ya Ya. I rushed down to get out of the dangerous cliff side and found Cosmo, Rooster, Woodchuck, and Aurora (another fellow hiker) huddled under a tree. I joined for a little while but eventually being poured on made me feel too cold to stay still. Woodchuck, Cosmo, and I hiked on in the rain. Eventually the storm passed. By 6:30pm we had finished 26 miles and continued on. At 29 miles we saw a lake and Cosmo, Utah Aaron, Ya Ya, and I all wanted to camp there instead of the parking lot we were headed towards. Soulshine was adorably excited about completing her first 30 mile day so she and the rest of the group continued on for one more mile. At the lake we cooked dinner by the light of headlamps before getting cozy in our beds. We slept in ( just a little bit ) and got to the trail by 7:30am. It was a nice walk into town, 15 miles to the parking lot. As we get closer to towns the cell reception gets better, and I seem to get distracted. I called friends and family as I hiked and checked in with my loved ones (thanks for putting up with constant dropped calls Dad). After a mile Aurora, Cosmo, and I arrived at the Carson Pass trailhead parking lot. 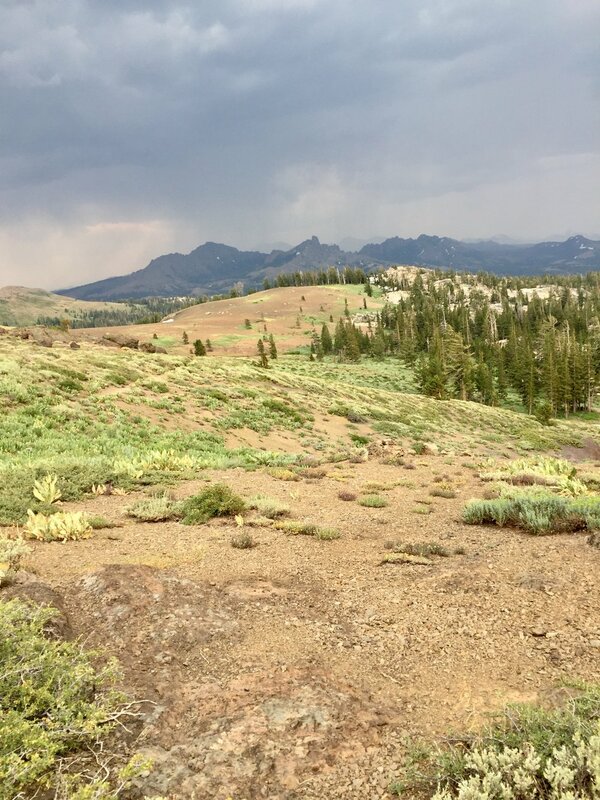 By the time we arrived to Carson Pass the visitor center was open and we were surprised with trail magic!! Linda, the visitor center employee, excitedly brought outside a bucket full of chips and cookies and fruit for us. I even got another Junior Ranger badge! 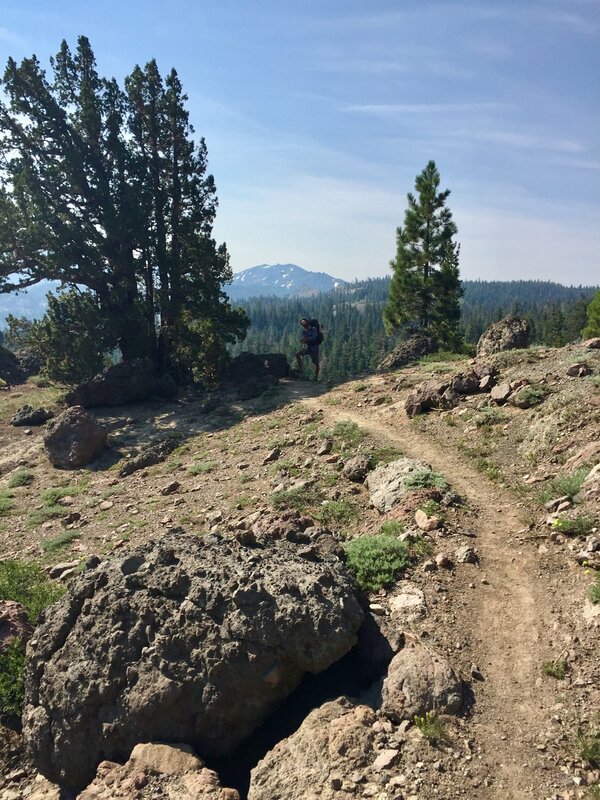 On this section of trail the PCT connects with the Tahoe Rim Trail (TRT), which is special to me. Last summer I hiked the TRT has my first thru-hike and my first time camping alone. It was a great experience, the weather was perfect, the wildflowers were abundant, and I felt surprisingly comfortably being alone in nature. If anyone is interested in a thru-hike I highly recommend the TRT as a perfect trail to test out your backpacking skills. Once I arrived at the Echo Summit Trailhead Cosmo and a hitch were waiting to take us into South Lake Tahoe. We made it to town and went right to the post office. I picked up my resupply, got a surprise gift from a friend from work (thank you Ms. Camacho, and thank you Marcia!) and swapped out my shoes after nearly 700 miles. Can you guess which ones are the old pair? We took our boxes and walked through Heavenly Village, an upscale ski area filled with restaurants, amusements and tourists that looked and smelled a lot cleaner than us. Cosmo and I strutted through in true hiker trash fashion. It was a strange feeling walking through, like we were on display. I could feel the glares of some folks and heard whispers from others, "Oh! PCT hikers!" The past few days have been great, but after the mosquitos, high mileage days, and thunderstorms, it's time for some rest and relaxation. Today was spent doing town errands and relaxing around Tahoe. Later in the evening the whole gang got together for some pre-bachelorette party festivities for Woodchuck. Most of the crew went out on the town to celebrate, but I was too tired to party. I got one more good nights sleep before heading back to the trail.